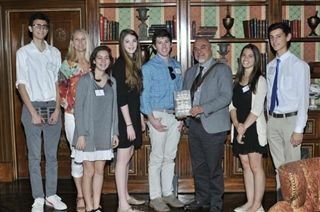 On January 15th, a group of seniors attended the annual Rancho Santa Fe Literary Society luncheon to meet Hector Tobar, author of Deep, Dark, Down: The Untold Stories of 33 Men Buried in a Chilean Mine and the Miracle That Set Them Free. The students spent nearly an hour with Mr. Tobar, discussing his experiences with the Chilean culture and his journalistic approach to storytelling. According to Ms. Juskaitis, the students beautifully represented Pacific Ridge's commitment to engaged learning by conducting themselves with poise, insightfulness, and enthusiastic interest.